Last week, the summer’s first great blockbuster suggested that men will kill the world; this week, in Brad Bird’s Tomorrowland, a young woman races to save it, with a little help from George Clooney. The movie is an earnest attempt to reverse-imagineer an emotionally resonant backstory for a section of Disneyland (and its various offshoot parks, from Orlando to Hong Kong) that’s never had characters or a narrative to call its own. 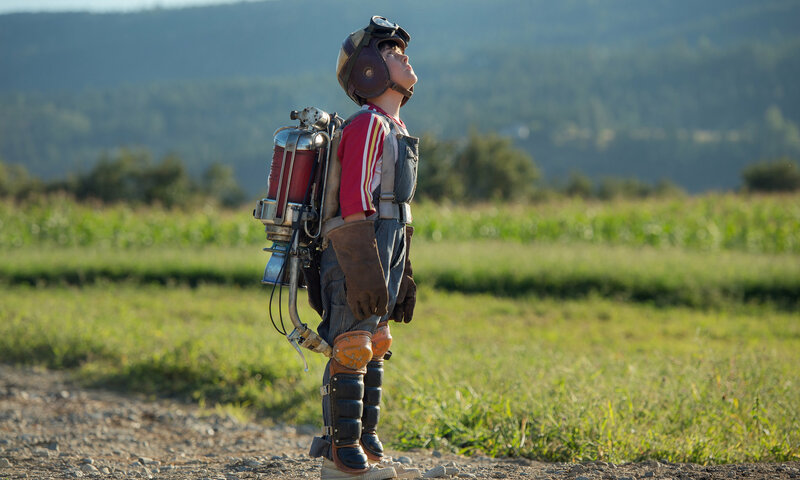 It brings a big, soft, in-the-right-place heart to the not wholly altruistic work of personalizing and deepening our relationship with a family of global brands.1 The values that Bird and co-screenwriter Damon Lindelof posit as Tomorrowland’s and by extension Disney’s are hard to argue with. Tomorrowland lionizes builders and engineers and yea-sayers and the dreamers of dreams, and implies that our largely pop-culture-fed defeatism about the future — embodied onscreen by several conspicuously placed billboards for an apocalyptic scary movie called ToxiCosmos 3: Nowhere to Go — might be a form of spiritual global warming with immediate and destructive consequences. Plus, by putting a female prodigy at the center of a story that would undoubtedly have been about a Very Special Boy had it been made even a decade ago, the movie takes a monkey wrench to the assumptions underpinning tech-bro chauvinism. Sure, the delivery system for these laudable messages is a two-hour-plus brand-identity spot, a corporate-communications grand slam whose bold idealism is inextricably entangled with a sales pitch — but in a sense, so was the part of Disneyland it’s based on. Construction on Tomorrowland began only six months before the park opened in 1955. By then Walt Disney — who’d embarked on the Disneyland project over the objections of his brother Roy, Disney’s CEO — had run through most of his $17 million budget, so Tomorrowland’s utopian/inspirational vision of far-off 1986 ended up featuring attractions underwritten by American Motors, GE, Goodyear, Bell Telephone, Richfield Oil, the American Dairy Association, TWA, Kaiser Aluminum, and Monsanto Company, whose all-plastic House of the Future invited park-goers to marvel at an “Atoms for Living Kitchen” with a “revolutionary” microwave oven. There’s historical precedent, in other words, for the moment late in the film when a montage of makers and fixers and artists and tree-planters and cockeyed optimists lingers on an industrial designer hard at work on the 2016 Chevy Volt. In the fourth-season finale of Mad Men, Don Draper brings his secretary Megan Calvet along on a trip to Disneyland for child-care purposes and ends up proposing to her out of nowhere; Matthew Weiner and cowriter Jonathan Igla called the episode “Tomorrowland,” so that we wouldn’t miss the implication that Don was high on his own supply of fresh-start fantasies. Megan and the Drapers visited in 1965; Tomorrowland got the first of many face-lifts two years later. For years, Tomorrowland was problematic from a theme-park-upkeep standpoint and fascinating from a semiotic one because it inevitably memorialized a vision of the future as seen from the past. In 1998, Disneyland unveiled a refurbished Tomorrowland that attempted to turn this bug into a feature, taking visual cues from the retro Jules Verne/H.G. Wells look of Euro Disney’s Discoveryland to create a “classic future environment.” This reboot has a New Coke reputation among Disneyland aficionados, but at least it was a look — these days the Tomorrowland in Anaheim is the most cluttered, crowded, airport-terminalish part of the park. Space Mountain and Buzz Lightyear’s Astro Blasters still pack ’em in, but there’s not even a hint of prognostication, unless you count the suspiciously todayish touch-screen developments on display in the Microsoft/HP/Taylor Morrison–sponsored Innoventions Dream Home, itself shuttered this past March. No future for you, except the seemingly inevitable one where all this prime real estate is overtaken by new Star Wars and Marvel rides. The problem with Tomorrowland isn’t that it’s a movie about Walt Disney’s highest ideals that can’t help also being an advertisement for Disneyland; it’s that it just isn’t much of a movie. It takes some cool chase-scene set pieces and some admirable articulations of unfashionable positivity and spackles the gaps between them by having people deliver nudge-winky shorthand lines like, “It’s important — they need to know the stakes!” and, “Time was running out and you needed motivation!” and, “Do I have to explain everything? Can’t you just be amazed and move on?” (Also, at one point, it’s explained that we’ve abandoned the space program because “it’s hard to have ideas and easy to give up”; at that point, a part of me also gave up.) Bird and Lindelof share story credit with Entertainment Weekly writer Jeff Jensen, who caught Lindelof’s eye with his grandly theoretical close readings of Lost episodes and is therefore the TV-recapping equivalent of The Last Starfighter. The conceit of the script is that Tomorrowland is an actual place — a parallel universe the world’s best and brightest created so that they could find each other and work to better society in an environment “free of politics or bureaucracy.” The idea of a gleaming realm outside time where the elite meet to invent the future unhampered by legislative oversight — an extradimensional TED or Davos for the successors of a secret society the film calls the Plus Ultra — is pretty much exactly what you’d expect from a collaboration between one of the puzzlemasters of Lost and the director of the crypto-Objectivist children’s classic The Incredibles. You never know who wrote what in a movie like this, but when an iconic monument turns out to conceal a steampunk Mission Control complete with scrolling-hieroglyph readouts, it feels like pure Lindelof; and when an electromagnetic pulse blacks out an entire city of mobile-device-clutching sheeple, leaving only a brightly glowing rocket carrying geniuses to their appointed world-saving mission, it feels like Ayn Rand. To its credit, the film does allow for the possibility that even a special club for awesome people might make the occasional mistake born of Promethean arrogance, personified here by Hugh Laurie’s cynical Governor Nix. And it’s not as if Rand invented the idea of great spirits encountering resistance from mediocre minds. 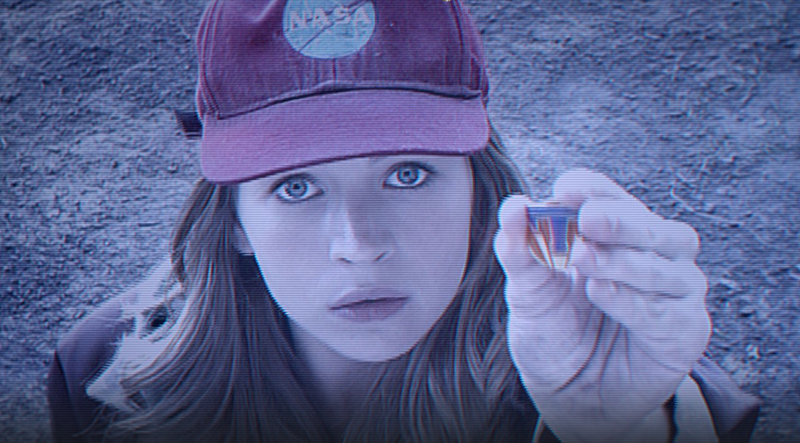 In Tomorrowland the spirit is young Casey, played with a realistic balance of pluck and petulance by Under the Dome’s Britt Robertson. When we first see Casey she’s using a toy helicopter to conduct drone warfare on the cranes poised to disassemble a Cape Canaveral launch platform and throw her NASA-engineer single father (Tim McGraw) out of work. Everything else we need to know about her comes through in a sequence in which Casey, squirming through her teachers’ lectures on dystopia, climate change, and mutually assured destruction, keeps raising her hand to ask the same question: “Can we fix it?” She’s a spiritual cousin to the astrophysics-obsessed Murph in Interstellar, who gets suspended for telling other kids the truth about the moon landing and grows up to be Jessica Chastain, solver of impossible equations. It’s been a good half-year for movies about smart girls who love science as much as they love their dads. The fact that Casey is a driven, irrepressible maker-builder type with no stereotypically girly qualities is undeniably cool and progressive; the fact that a movie conceived by the studio most responsible for perpetuating the princess-industrial complex treats this as a normal and even unremarkable way for a girl to be, even sparing her the distraction of a love interest, is even cooler. Of course, Tomorrowland doesn’t exactly smash the binary between pink and blue: It renders Casey’s life choices plausible by sealing off traditional femininity as an option. Technology is still ultimately portrayed as a man’s world, albeit one that can’t ignore someone of Casey’s acumen; there’s nothing in this film as quietly revolutionary as the scene in the Halt and Catch Fire pilot when a daughter watches her mother rewire a Speak & Spell. Believers in Disney’s alleged conspiracy against moms won’t be surprised to learn that adult women basically don’t exist in this story at all, except for one caricature-ish teacher and Kathryn Hahn, who shows up behind the counter along with Keegan-Michael Key when Casey stumbles into a sci-fi memorabilia shop looking for answers in a scene that feels lifted from a sillier and perhaps better movie. By that point she’s already found a techno-magical T-shaped pin and glimpsed the spires and hover-trams and happy, pointedly diverse pedestrian crowds of the world to come, in an affecting sequence that plays out as much on Casey’s delighted face as it does on the CGI castles in the air. It’s a while longer before she finally encounters reclusive tinkerer Frank Walker (Clooney), who’ll become Casey’s grumpy guide on the path to destiny. Of all the things this film asks us to believe, the notion of George Clooney as an apparently monkish bachelor who never got over the girl he met at the ’64 World’s Fair is the hardest to accept. Walker is barred from Tomorrowland for irresponsible inventing; the room where he obsesses over a wall of bad-news feeds is sort of the Disney version of the apartment where Lost’s Matthew Fox grew a playoff beard and tried in vain to plot a return to the Island in between driving around Los Angeles popping pills and listening to In Utero. Clooney’s performance has a nice, underplayed Henry Fonda quality, with a soupçon of Nick Nolte every time something makes him say Aww, hell. Which is often. Eventually we get your basic confrontation between protagonists and antagonists with the world hanging in the balance — which feels a little rushed after all the chasing that led us here, although there’s a cool robot involved — and then a coda whose specific emotional resonance will feel familiar if you’ve ever been tricked into tearing up at what turns out to be a commercial for a new energy-efficient light bulb. Before that, there’s a minor twist I took as a surprisingly sharp elbow thrown at Hollywood, where some of the world’s best and brightest minds join forces to devise ever-more-realistic and terrifying depictions of cataclysm, a meta film-critical touch that will undoubtedly seem that much more ironic when Tomorrowland gets knocked off the top of the box office heap by San Andreas next weekend. We like apocalyptic futures, one character says, because they ask nothing of us; Tomorrowland can’t quite sell the alternative, but at least it dares to imagine something different. Speaking of: I should probably get the customary disclosures out of the way sooner rather than later in this case. Disney Parks is a division of the Walt Disney Company, as is ESPN. Writing about this particular movie in this space feels not unlike reviewing National Lampoon’s Vacation for a publication staked by Marty Moose.